Player Spectator is a free flying camera without a physical body that is used to create a spectator mode. It can collide with objects but cannot push or interact with them. Viewport mask, specifying objects that can be seen in the camera's viewport. 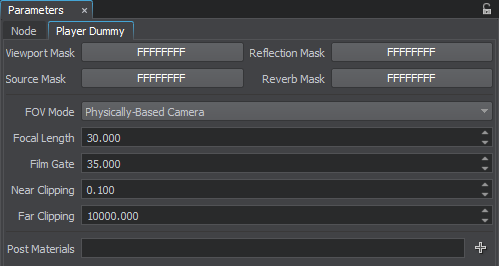 Reflection mask, specifying if the reflections will be rendered into the camera's viewport. Sound source mask, specifying what sound channels are played for this camera. Reverberation mask, specifying what reverberations are played for this camera. Vertical FOV is used for the standard player. In this case, the FOV is set in degrees. Player's vertical field of view, in degrees. Focal length of the physically-based camera lens. Film gate for the physically-based camera with horizontal FOV. Distance to the near clipping plane of the player's viewing frustum, in units. Distance to the far clipping plane of the player's viewing frustum, in units.